​A-Frame Cart – A padded cart for moving glass and large conference tables. Air-ride Truck – Suspension system on vehicles to provide smooth ride. Annual Contract – A contract defined with set rates and specific terms. Around the Clock Move – A move that includes several consecutive shifts, including midnight, and continues without stopping. Bio/Hazmat – Hazardous Materials found in laboratories. Bookcart – Specially designed cart for relocating library collections in exact order. Carpet and Paint Jobs – Moves conducted while clients undergo internal renovations. Climate Controlled Warehousing – Storage with temperature and humidity controls. Computer Bin – Heavy duty tri-wall containers designed for moving computers. Computer Crate – Recyclable polystyrene crate built for moving a personal computer. Corner Protector – Heavy duty protection used for corners of door frames. Corrugated Wall Protection – Type of cardboard utilized to protect finished walls. Crane Bucket – A large, metal container with no top and removable end doors. A crane bucket is used in conjunction with a crane to deliver/remove large items that cannot be delivered/removed in a conventional way (elevator or stairs). This is usually accomplished through a window that has been removed somewhere on the customer's floor. Custom Crating Service – A service that is used to protect large items, fragile items, breakable items, or all of the above. These type of items include: large pieces of glass (desktop glass or actual glass tables/desks), any marble, granite, or other fragile stone, pictures of larger size and/or value. Custom Crating Service protects the customer's fragile items while also giving peace of mind to that particular customer and the movers on site. This service is a must-use on the items listed above. It is an extra expense that is well worth the price. The alternative is much more costly! Dolly – Four wheeled platform used to move boxes, furniture and equipment. Constructed of oak or polystyrene with carpet or rubber padding. E-Track – This is located inside the loading area of Trucks and Trailers. It is located on the inside walls of the back of the truck or in the trailer and is used with straps to lock/secure items while in transit. There can be separate rows of E-Track on each side of the side walls. FastKrate – A recyclable polystyrene box or "crate" with integrated lid that is approximately 3 cubic feet. It has a specially made dolly (metal or plastic) where it is placed before packing. The first crate is placed on the dolly, it is packed, lid is closed, and another crate is placed on top on the bottom crate. This is possible due to the manufacturing of the crate lids. They are grooved to allow for placement of crates on top of one another. The crates are usually stacked 4-high per dolly. File Cart – Moving equipment designed for files. Flat Price – Also known as "Firm-fixed" pricing, It is an agreed-upon amount for a specifically identified scope of work and is not subject to time and materials fluctuations. Floor Load – Loading items on trucks and removing from the dollies. Forklift – Warehouse vehicle used to lift heavy items. Fully Insured – Everything we handle is insured. Homosote – Building protection for marble and granite floors. 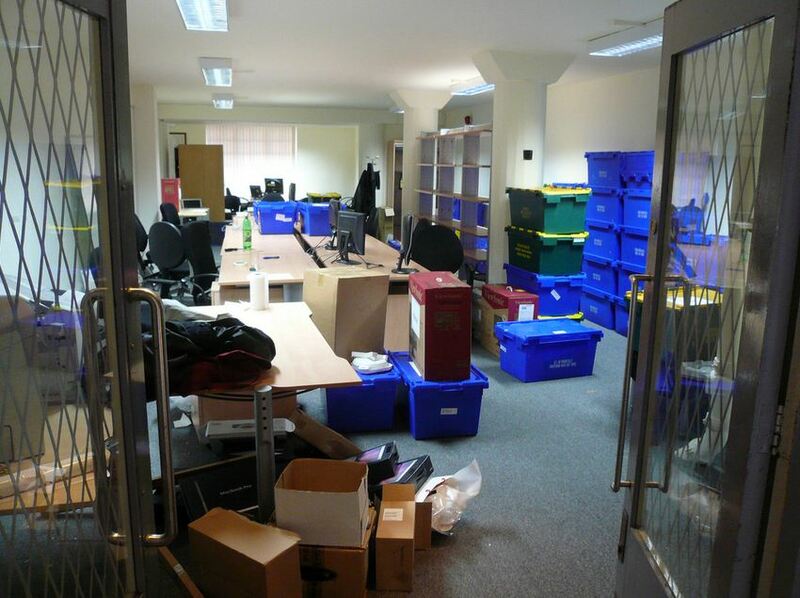 Internal Move – Move or relocation within a building. J-Bar – Moving equipment used to gain leverage while moving heavy items. 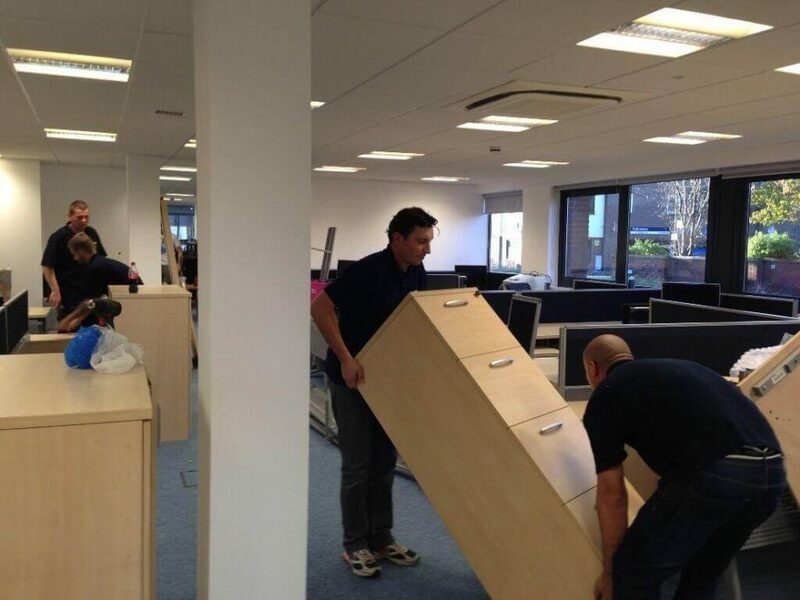 Library Move – Generally moving a library from one place to another, but may indicate certain types of reorganizations and reconfigurations. Liftgate Truck – Straight truck or moving van with hydraulic gate for loading and unloading from ground level. Pad Wrap – A procedure in which a piece of furniture or equipment is protected from damage using a cloth blanket or quilted paper pad. Pallet Jack – A manual piece of equipment used to move or transport palletized material. Panel Cart – A manual piece of equipment used to transport large flat pieces such as conference tables, white boards, modular workstation panels and work surfaces. PC Tech – A person who disconnect and reconnects computers. Placards – Signage depicting furniture placement within the new work area. Platform/Portable Dock – Used when no permanent loading dock is available. 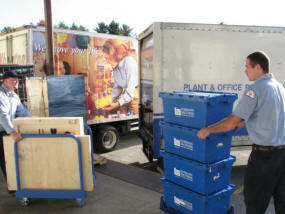 Platforms and portable docks add to the efficiency of large relocations. Prop Load – Trucks loaded and held for delivery the following day to the new facility. Relocation – Generally refers to moving between buildings. See also "internal move". Revelator – A piece of equipment that is used to move heavy items from or to a high location such as a shelf or a rack. Rigging – Preparing the product to be hoisted by a crane, wench or other mechanical device, or the act of moving/lifting large heavy items using ropes, chains, wires or crane. Safe Jacks – AKA Roller Jacks. Used for safes and heavy equipment, used only in sets of two. Each jack is equipped with a hydraulic jack and wheels to raise piece off the ground and roll on to truck. Shrink-Wrap – Plastic /cellophane wrap, used for holding cartons to skids or pads to furniture. Shuttle – A move with crews at both origin and destination and trucks "shuttling" material between the two. Generally reserved for large projects. Skates – (Rigging Equipment) placed under large equipment. Used similarly to a dolly. Stair Carry – To physically carry items up and down stairs. Stair Crawler – Equipment used for moving copiers and safes up or down stairs. Has motorized tracks to climb stairs. Cannot be used on carpeted stairways or stairs that have rubber treads and/or tile. Maximum capacity of crawler is 2200 lbs. Stevedore –Commercial hand truck with a set of stabilizing wheels on the back. Also has a heavy duty strap and clasp to wrap around piece being moved and secured to stevedore. Used primarily for moving safes, vending machines and heavy equipment and cabinets. Tally Load – A 600 cube truck load. Time & Materials – Work done on an hourly basis. Customer is charged actual time the crew works plus any materials used on project. Tote Carton –A 23x10x12 single ply cardboard box that is prefabricated for easy assembly. Requires no tape to assemble and includes side handles for easy transportation.